If you are in need of car electrical repair services near San Dimas, then you would be remiss if you didn’t turn to the team here at Johnny’s Auto Service! We are a family owned auto shop with a team of experts who take great pride in the quality of our work and the satisfaction of our customers. There is a good reason why drivers searching “auto electrical mechanic near me” online find us! The importance of your car’s electrical systems simply cannot be overstated. They are becoming more and more prevalent, particularly in modern vehicles, and are at least partially responsible for your vehicle’s ignition, engine management, radio, computer systems, telemetrics, and much more. These systems are complex and should not be tampered with unless you have adequate auto repair knowledge. Luckily, we are a AAA Approved Auto Repair Shop that has been awarded with one of the highest achievements and certifications available in the field of automotive service, the ASE Blue Seal of Excellence. 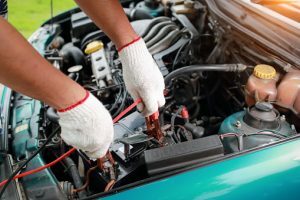 This means that we are a car electrical repair service in the greater San Dimas area with a team of technicians that receive the latest training and auto repair techniques in the industry, ensuring that every repair is seamless. No matter how minor or major the job may be, you can be confident that our professionals will provide you with services and workmanship that demonstrate the pride and skill that they possess. There is no need to keep searching for “auto electrical mechanic near me”, when you can simply get the best car electrical repair provider near San Dimas, here at Johnny’s Auto Service. If you would like to learn more about what we can do for you and your vehicle, feel free to give us a call at (626) 966-5212. One of our professionals will be more than happy to answer any questions or concerns that you may have. Don’t wait, contact us today!